Soup and pie, two of my favorite foods, are the topics on this week's GREAT TASTE show. The opening segment features my convesation with well-known cookbook author and photographer, Barbara Abdeni Massad followed by Ms. American Pie, Beth Howard. Living in Beirut, Lebanon, Barbara Abdeni Massad knows how challenging and stressful daily life is, however, her problems pale compared to the conditions in the Syrian refugee camps less than an hour from her home. Her most recent project, the book, Soup for Syria provided a way for her to help, and allows anyone around the world to participate in the relief effort. The cookbook features soup recipes in collaboration with over 80 chefs, and Barbara's photography, All the profits from sales are donated to the UN Refugee Agency, which provides needed food for the Syrian refugees. You can purchase the bookHERE, and aid the nearly eight million Syrians who have been displaced. I never get tired of seeing someone make pie. I recently watched Julia Child prepare a French pie crust, and longed to taste the end result-an apple pie with sliced apples on top and a thick apple sauce filling. If you were one of the lucky folks who came to Green Building Supply Tuesday evening you droolingly watched as Beth Howard created a sensual chocolate pudding pie, and, even better, got to taste it fresh out of the oven. For the radio portion of the show, Beth and I talked about her recent "World Piece" trip. That voyage took her all over the world including stops in India, Lebanon (where she stayed with Barbara), Greece, Australia, New Zealand and Germany. At each stop, Beth did demos where she made American-style pies and learned how to prepare baked goods from her hosts. You can watch the entire hour of the show with Beth courtesy of Fairfield Media Center. Click HERE. You can purchase Beth's latest book, Ms. American Pie HERE. The At Home Store has copies of the book, and if you email Beth she'll send you her cut signature for easy placement within the book. Great idea for a holiday gift for yourself or someone special. Mark on your calendars that GREAT TASTE is live the first Tuesday of every month at Green Building Supply. Our next live show is Tuesday, January 5. Many thanks to our sponsors, Green Building Supply and Everybody's, who help support KRUU FM. This is a special rebroadcast of one of our listeners' favorite shows. A few Salt Lake City update tidbits: Amano is still one of my favorite chocolates. Pago, where Chef Phelix Gardner oversees the food, won best SLC restaurant 2014 from Salt Lake Magazine. Tony Caputo's has a terrific website and it's easy to order from them. Next week: Claire Cheney on spices and a slice of the Fairfield Farmer's Market. ONE MORE NOTE: Showing at The Orpheum starting this Friday-The Lunch Box. Thanks to Kristian Day for bringing this film to town! It was a delicious experience being in Salt Lake City last week. I had excellent meals at the Copper Onion and Pago. More about those meals on the show. 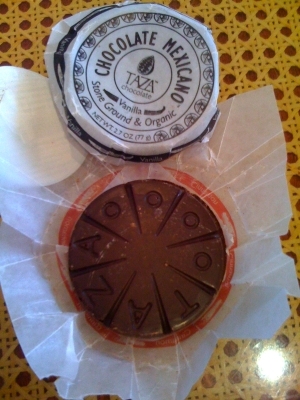 I love chocolate so it was a treat to enjoy in SLC a brief Chocolate 101 session at Tony Caputo's Market and Deli. This "must" destination fine food shop downtown has its own cheese cave, an in-house salame maker, and a overwhelming number (more than 300) of cacao bean products including three types of rich chocolate drinks that should come with some type of government warning label. The devil lurking behind these temptations is one of this week's guests, Matt Caputo. Here's how one website described him. "Matt Caputo is one of the world's most discerning connoisseur of fine chocolate bars. The award winning chocolate tasting classes he teaches at Tony Caputo's Market & Deli are highly recommended by many media outlets, chefs and even numerous international chocolate experts. His in-depth research is not limited to books and the internet, he has traveled the globe to meet and learn from the most respected chocolate makers in the world." What do Tom Waits, Snow Patrol, Crowded House, Beastie Boys, Johnny Cash, Thom Yorke, DJ Shadow & UNKLE, Florence & the Machine, Matthew Good, Jefferson Airplane, Brewer & Shipley, Byrds, Nitty Gritty Dirt Band, Alan Jackson, Hank Williams, Leonard Cohen, Patti Smith, Ministry, Elton John, Velvet Underground, ZZ Top, Black Sabbath, Queen, Manassas, John Mellencamp, Aerosmith, and Nina Hagen have in common? Chocolate, eggs, rabbits & Jesus!! Tune in for our EASTER special, folks. You'll agree the Lord definitely moves in mysterious ways. The Age Old Question Is Answered: Can Milk Duds Be Made Healthy? This week Generation whY answers the first question in Human History, "can Milk Duds be made healthy"? Two weeks ago I challenged Fitness Superhero Miss Barbella, aka Tanell Pretorius, that she could not make God's chosen food, Milk Duds, healthy. Since Andrew Tint isn't the end all be all of judging chocolate, we luckily got a man who was, Noah Lion, of Noah's Rockin Raw Chocolate. Tune in live to find out if Milk Duds are going to be replaced. Originally from South Africa, Tanell Pretorius moved to London, in the United Kingdom, at the age of 19 to pursue a career in modeling. She worked as a fashion and sports model for seven years and had agents in London, Milan, Hamburg and Cape Town. She was featured in numerous TV commercials from Sony Playstation to Veet Wax. In 2011 she moved to Fairfield, Iowa, to complete an undergraduate degree in Me dia and Communications at Maharishi University of Management. She has since moved her focus to writing, personal training, and Ayurvedic consultant practice. Her passions are self-development and sharing her knowledge and experience of health and wellness with others. She also writes currently for IOWA SOURCE. Noah Lion is the Founder and Creative Director of Noah's Rock'n Raw Chocolates! Noah started making Chocolate at the age of 8, and spent his childhood building eco-friendly houses before becoming a full time Raw Chocolatier. When Noah realized how terrible processed sugar is he began making his own raw desserts, quickly founding that after adding all his favorite ingredients together everyone seemed to love his chocolate almost more than he did. From there he started serving chocolate at local markets, stores, and created the online store NoahsRocknRawChocolates.com Noah now lives in Manhattan where he provide Raw Chocolate for thousands of chocolate lovers across the nation. It was a delicious experience being in Salt Lake City. I had excellent meals at the Copper Onion and Pago. More about those meals on the show. Starting a Food Business from Scratch and What to Cook to Impress a Girl! Another delicious show is set for this week's version of Great Taste. Barbara Yeager joins us in the studio. Normally, she resides in Boulder, Colorado where she's engaged in creating all organic raw cacao bites with names like Heart Throb, Cosmic Mint, and Naked. Her Life Openings chocolates are made without dairy, soy or gluten and sweetened with a low glycemic agave. Not much can be said right now about this week's GREAT TASTE because we're doing a blind chocolate taste test during the show. Fifteen studio slots have all been filled with our "listener tasters" and they will have a chance to evaluate the five or six different chocolates before we reveal the details of each special bean. Guiding us through the process in the studio will be Leonard Pitt, founder of the Berkeley Chocolate Club. Get some special chocolate ready at home and taste along with us because you'll have the opportunity to learn exactly how to experience the bean and evaluate different qualities and characteristics. A big "Thank You" to the At Home Store and Rosie Witherspoon who is providing the amazing chocolate we'll taste on the show. On two recent trips to India, chocolate and candy maker Paul Poole has been fortunate to catch an intimate glimpse into the lives of some Indian families. The key was the sharing of food, but not only meals. Paul taught his Indian friends how to make various types of chocolates and they shared the knowledge of local sweets. GREAT TASTE listeners will not only hear about Paul's adventures, but learn the recipes involved in this cross-cultural exchange. Fairfield, IA craftsman Paul Poole began making chocolates, toffee, and other sweets in the late 70's in San Francisco. At times he actually sold his creations, but for the greater part of three decades you might have received some as a gift if he made a custom kitchen cabinet for you. Even now you have to be lucky. If you aren't on his holiday list, then the "right place" (KRUU's studio) is your best shot. GREAT TASTE IS ALL ABOUT CHOCOLATE 7:00-8:00 PM WEDNESDAY! Meet Shawn Askinosie, the guy pioneering amazing chocolate from his direct farm purchases of the raw materials. He is way more than fair-trade, actually forming a collaboration between the farmer and the end product. It's amazing. We aren't kidding. Oh, and Kathy is making a chocolate pie to go along with our chocolate tasting hour. 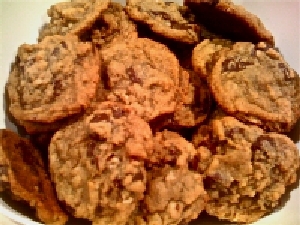 We'll post a pic and the recipe in the next blog. or 7:00-8:00 AM on Friday if you miss the REAL thing!